Despite its location in South America, Santiago has a distinctly European feel, from its neoclassical architecture to its efficient metro system, Santiago is one of South America’s most sophisticated cities and a must-see if you are visiting Chile, even for a short while. 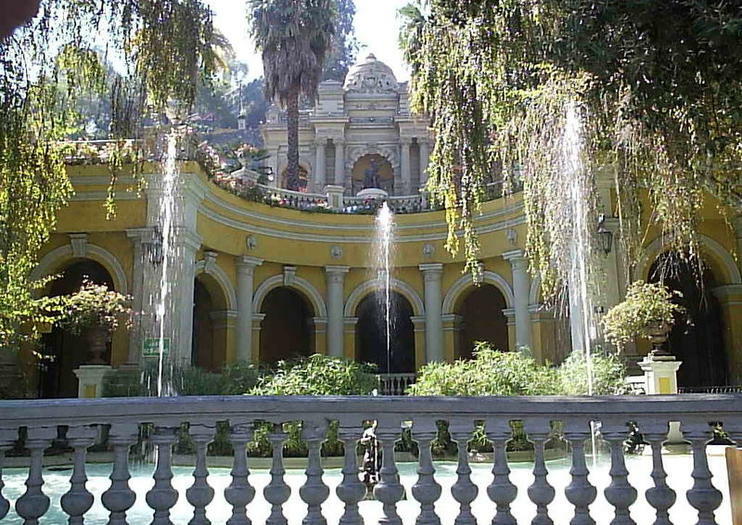 A great way to get acquainted with Santiago is to take a city tour. Cruising through the city streets, you’ll notice the varied architectural designs—Santiago’s buildings and monuments are a cavalcade of European styles, especially the Parque Forestal, which is based upon Paris’ Champs-Elysees. The tour finishes up at Los Graneros del Alba, a handicraft village located near the famous church of Los Dominicos. Here you can browse handmade sundries and souvenirs as well as sample Chilean cuisine. As the tour is about 3 ½ hours long, the village is a great stop for a late lunch or early dinner. Either way, you’ll have plenty of time to enjoy the Chilean capitol’s sights. On your second day, experience another side of Chile with a private tour of the Cousino Macul and Concha y Toro wineries. Here, you’ll get to sample some of the top vintages from two of Chile’s most famous producers against the serene backdrop of Chile’s rural countryside. This day trip is a wonderful and relaxing outing, especially after exploring and sightseeing the day before. However, if you should happen to visit Santiago during the ski season (June through August), on your second day, skip the wineries and hit the slopes. Portillo is one of the top ski resorts in Chile and short trek from Santiago. If you book a tour, you’ll learn the history of the mountain, as well as that of the adventurers and explorers who climbed the Andes and explored the region. Ski rentals are available at the resort. Your last day in Santiago should include a trip to the Valle Nevado Ski Resort. June through August, Valle Nevado offers some of the best runs in the southern hemisphere, and during the rest of the year, the mountain scenery makes for great backpacking. The trip to the resort from Santiago takes you past a number of quaint mountain villages, and the views of the Andes are bar none. Of course, mountain villages and racing through fresh powder are not for everyone; if you fall under this category, then spend the third day of your trip taking a tour of Isla Negra, the former home of Nobel Prize winning author Pablo Neruda. This charming beach-side village features eccentric architecture and a museum to Neruda’s life and works, and the tour makes a stop at the village of Pomaire, known for its fantastic clay pottery. Gallop through Chile’s magnificent mountains on an exhilarating horse riding tour from the city of Santiago. Escape the crowds of the capital and inhale fragrant woodland air as you canter across gentle streams and rocky river beds with an experienced guide. Ride atop a strong and secure Criollo horse as you enjoy the rugged and remarkable natural panorama - no experience is necessary to ride these horses, renowned for their mild temperament and impressive stamina. Convenient round-trip transportation from your Santiago hotel is included in the tour. Pleasure your palate to the explosive flavors of Chilean cuisine during a 3-hour folklore show and dinner tour from Santiago. Sample delicious dishes inspired by the region’s most popular recipes, feasting upon a 3-course meal made from premium ingredients. While you dine, enjoy the melodious music and vibrant color of a Chilean folklore show, the traditional dances and songs of which have originated from various regions in Chile. Immerse youself in the Chilean way of life during this taste bud tantalizing tour. Discover Chile’s winemaking heritage and sample a variety of local wines on this full-day tour of the Colchagua Valley from Santiago. Journey through the vineyards, stop for lunch in Santa Cruz (optional) and tour two of the region’s famous wineries like Montes and Viu Manent. Learn the secrets of vine cultivation, production and aging as you explore the wineries and taste popular wines like malbec, syrah and carmenere. This small-group tour has a maximum of eight for a personalised experience. Escape the city and breath in the mountain air on this tour to the Yerba Loca Sanctuary from Santiago. Keep your camera close by as you set out on a leisurely 4-mile (6-km) hike, soaking up views of the Villa Paulina valley, La Paloma Glacier and the looming peaks of Los Piches and El Altar. Look out for wildlife like grey fox and Chilean condor along the way, then tuck into a picnic lunch (included) before heading back to the city. Combine a typical Chilean meal with a folklore show during this 3-hour experience in Santiago. The 3-course meal includes wine or beer; private hotel pickup and drop-off provided. Enjoy a mouth-watering introduction to Chile’s traditional cuisine with this private 6-hour tour and cooking demonstration in Santiago. Shop for seasonal ingredients and spices at the bustling La Vega and Mercado Central markets, then help prepare a range of authentic local dishes at a chef’s home kitchen. Pick up expert tips and tricks to help you recreate the recipes at home, then tuck into a delicious 3-course meal, accompanied by cocktails and coffee. Experience the sublime sights and incredible cuisine of Chile’s captivating capital on an evening sightseeing tour with dinner. Visit some of Santiago’s most bohemian and beautiful neighborhoods as you tour its historical highlights with a knowledgeable guide. Absorb arresting views of the sparkling city by night from the top of San Cristobal Hill; see the palatial La Mondea bathed in the ambient light of evening; and feast upon a gastronomical selection of local specialties at the refined Borde Rio restaurant complex. An intimate atmosphere is guaranteed on this small-group tour, where numbers are limited to just six people.